AUD 13,603 Excl. Duties / Taxes. This Radiant diamond is 2.12 carat in weight, and comes with Excellent polish and Very Good symmetry, as verified from an independent gemological laboratory. 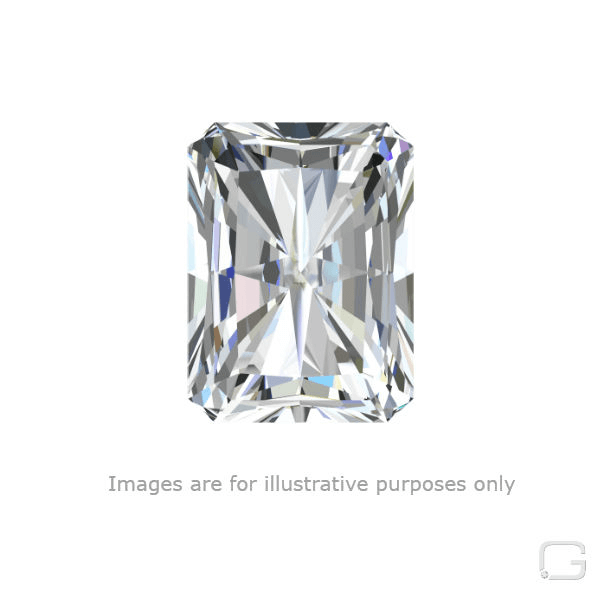 The diamond is graded J in colour, and has a clarity grade of SI1. The diamond's GIA grading report number is 5182661235, which will detail further its specifications and measurements, and will also come with the purchase of the stone. This Radiant diamond is 1.52 carat in weight, and comes with Very Good polish and Very Good symmetry, as verified from an independent gemological laboratory. The diamond is graded F in colour, and has a clarity grade of SI1. The diamond's GIA grading report number is 6242520070, which will detail further its specifications and measurements, and will also come with the purchase of the stone. AUD 8,034 Excl. Duties / Taxes. This Radiant diamond is 1.12 carat in weight, and comes with Very Good polish and Good symmetry, as verified from an independent gemological laboratory. The diamond is graded E in colour, and has a clarity grade of SI1. The diamond's GIA grading report number is 2173616304, which will detail further its specifications and measurements, and will also come with the purchase of the stone. AUD 2,609 Excl. Duties / Taxes. This Radiant diamond is 0.92 carat in weight, and comes with Good polish and Good symmetry, as verified from an independent gemological laboratory. The diamond is graded K in colour, and has a clarity grade of SI1. The diamond's GIA grading report number is 1102251390, which will detail further its specifications and measurements, and will also come with the purchase of the stone. This Radiant diamond is 0.59 carat in weight, and comes with Very Good polish and Very Good symmetry, as verified from an independent gemological laboratory. The diamond is graded D in colour, and has a clarity grade of SI1. The diamond's GIA grading report number is 5182421451, which will detail further its specifications and measurements, and will also come with the purchase of the stone. This Radiant diamond is 1.02 carat in weight, and comes with Very Good polish and Very Good symmetry, as verified from an independent gemological laboratory. The diamond is graded F in colour, and has a clarity grade of SI1. The diamond's GIA grading report number is 14816679, which will detail further its specifications and measurements, and will also come with the purchase of the stone. AUD 10,341 Excl. Duties / Taxes. This Radiant diamond is 1.31 carat in weight, and comes with Very Good polish and Very Good symmetry, as verified from an independent gemological laboratory. The diamond is graded D in colour, and has a clarity grade of SI1. The diamond's GIA grading report number is 5293120865, which will detail further its specifications and measurements, and will also come with the purchase of the stone. AUD 14,642 Excl. Duties / Taxes. This Radiant diamond is 1.7 carat in weight, and comes with Very Good polish and Good symmetry, as verified from an independent gemological laboratory. The diamond is graded H in colour, and has a clarity grade of SI1. The diamond's GIA grading report number is 2141689581, which will detail further its specifications and measurements, and will also come with the purchase of the stone. AUD 4,542 Excl. Duties / Taxes. This Radiant diamond is 0.93 carat in weight, and comes with Good polish and Very Good symmetry, as verified from an independent gemological laboratory. The diamond is graded E in colour, and has a clarity grade of SI1. The diamond's GIA grading report number is 5131284266, which will detail further its specifications and measurements, and will also come with the purchase of the stone. AUD 13,207 Excl. Duties / Taxes. This Radiant diamond is 1.5 carat in weight, and comes with Excellent polish and Very Good symmetry, as verified from an independent gemological laboratory. The diamond is graded E in colour, and has a clarity grade of SI1. The diamond's GIA grading report number is 1196661347, which will detail further its specifications and measurements, and will also come with the purchase of the stone.